UAB School of Medicine welcomed the Class of 2021 at orientation on Monday, July 24. 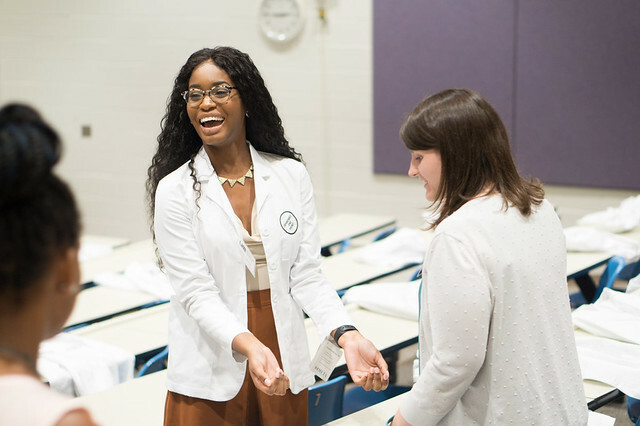 During this week, medical students are sorted into their Learning Communities, spend time getting to know their fellow classmates and hear from faculty members in Medical Students Services and the Office of Undergraduate Medical Education. Students also spend Thursday on their assigned regional campuses, completing community service projects in Birmingham, Huntsville, Tuscaloosa and Montgomery. Monday students were welcomed with a video from Dean Vickers before getting a view of what the next four years of medical school will look like and breaking into their Learning Communities. Tuesday and Wednesday were spent attending a variety of different seminars and the student organization fair. Thursday the students traveled to their regional campuses to see where they will be spending their third year. Orientation will conclude on Friday, July 28 with a seminar about what is expected of them as they begin their medical school careers. The students will complete their first medical school class next week, “Patient, Doctor, Society.” PDS is a two-week course that provides a general overview of the human aspect of medicine, medical ethics and how doctors can serve as advocates for their patients. The students will receive their white coats after they complete this course. The White Coat Ceremony will be held on Sunday, August 13 from 2-2:30 p.m. at the Alys Stephens Center.